Many young people in Northeast China have modest ambitions, with their lifetime goal simply to get a job - any job - inside "the structure." This "structure" means the region's sprawling public sector, which includes government agencies, State-owned firms, official institutes, hospitals and schools. The Northeast - covering the provinces of Heilongjiang, Liaoning and Jilin - had the worst investment environment in China in 2016, according to a December 2016 report released by the Academy of Economic Studies in the 21st Century, chinanews.com reported. The over-dominance of State-owned firms has hindered the development of the market economy in the region, and people are still dependent on the "structure," Hu Xingdou, economics professor at the Beijing Institute of Technology, told the Global Times. "When people in my hometown talk about their work, others first ask if the job is inside the structure or not, especially the older generation," said Qu, a 25-year-old resident of Jilin city, Jilin Province. "Most of my peers who have remained in the Northeast are working inside the structure. Even though I work in Beijing, my last job in a start-up company dissatisfied my father a lot, because it isn't in the structure," Qu said. Experts estimate that 64 million people were working in the public sector in China as of the end of 2014, the Economic Information Daily reported in September 2015. Some young graduates take the civil service exams up to nine times to try to get into the structure, spending a lot of money along the way, Phoenix Weekly reported. "Even a cleaning job will have many applicants competing for it, just because it is in the structure," the report said. 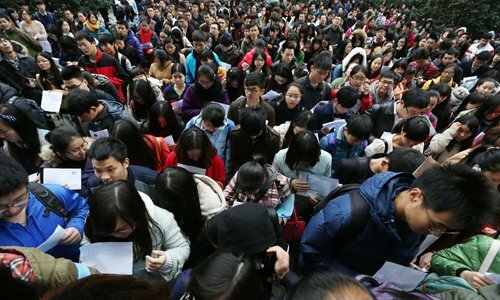 According to a 2015 Jilin University report, 37.57 percent of the top school's graduates chose to join State-owned companies, while the rate for graduates from East China's Zhejiang University and Southwest China's Sichuan University were 20.74 percent and 11.56 percent, respectively. "People in my hometown think any position related to the government is super awesome," Qu, told the Global Times on Monday. "They think such jobs will be stable for a lifetime," she added. University in Changchun, the capital of Jilin, said. Yi said that almost his entire family work for State-owned companies or institutes. "From time to time they remind me to join the structure after graduation, but they leave the choice up to me," Yi said. Qu admitted that some outside the structure, who chose entrepreneurship or working for foreign companies, are actually developing better. Deng, a resident of Liaoning capital Shenyang, said that young people from his hometown are increasingly choosing to work in China's most developed cities such as Beijing and Shanghai. "Who wants to do one fixed job forever? Members of my generation care more about realizing their own values," Deng said. "The Northeast is dominated by State-owned companies and is greatly influenced by the planned economy," Professor Hu told the Global Times. "People there do not understand how talents move around the country and are less likely to start their own business," Hu said. The Northeast was among the first regions in China to become industrialized. Its traditional industries include steel, automobile, shipbuilding, aircraft manufacturing and petroleum refining, the Xinhua News Agency reported. "In reality, the economy is not very developed in the region, so people prefer to have stable positions in the structure. Some of them even seek grey income through illicit means," Hu added. "However, young people should not only see the stable life in front of their eyes. China is undergoing reform, so in the future people inside the structure might find that their structure jobs aren't as stable as they thought," Hu noted. State-owned enterprises will be restructured, private firms will receive more support and regional cooperation will drive robust development, according to a document jointly published by the Communist Party of China Central Committee and the State Council in April 2016, aiming to rejuvenate the northeastern rustbelt. The Northeast should focus on developing the market economy to boost private companies and provide young people more opportunities outside the public sector, Hu noted. "Otherwise, the powerful State-owned businesses would continue to stymie the development of the market economy, and private companies will be dependent on the government and occupy a low position in society, which will make people still prefer working inside the structure," Hu said. "It can be a vicious cycle," he said.